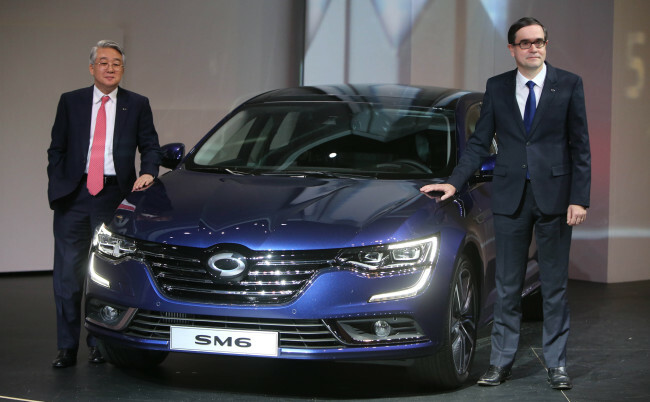 TAEAN, South Chungcheong Province -- Renault Samsung Motors unveiled the SM6, a face-lifted version of the Renault Talisman, which has been exclusively redesigned to satisfy local tastes, in South Korea on Wednesday. The SM6, released by France-based Renault as the Talisman in July 2015, is a premium midsize sedan codeveloped by designers and engineers at Renault and Renault Samsung. Targeting drivers in their 30s and 40s, the vehicle touts exclusive driving technologies as well as a longer wheel base compared to conventional midsize sedans, offering added room and interior mobility. The local automaker has positioned the vehicle as an upscale addition to the country’s midsize sedan segment, with ambitious goals to sell more than 50,000 units this year and emerge as a “new leader” in the diminishing vehicle segment. “The SM6 will set a new standard for Korea’s midsize sedan market,” said Renault Samsung executive vice president Park Dong-hoon during a media debut event held at Hanseo University’s Flight Education Center in Taean County, South Chungcheong Province. Park said locally made midsize sedans have been losing popularity in recent years given not only the rising popularity of imported car brands and small sport utility vehicles, but also domestic carmakers’ failure to implement the latest technologies into their vehicles and grant emotional satisfaction to consumers. “I believe the SM6 will be able to newly fill this gap to grant greater satisfaction to our customers,” the executive vice president said. Seeking to win back consumers, Renault Samsung said the new vehicle features a number of premium automobile technologies that have yet to be implemented in competing models in the segment in Korea. The new vehicle boasts an exclusive power train, chassis and operational system as well as a smooth design, setting it above its competitors, according to the carmaker. The upgraded power train is made with engines and transmissions built by the Renault-Nissan Alliance. Drivers can select from the 2-liter GDI, the 1.6-liter turbo GDI, the 2-liter LPLi and the 1.5-liter diesel engines, which the carmaker claims offer high fuel efficiency unseen in other midsize sedans in Korea. On top of its slick design and spacious interior, the SM6 is topped with the Renault Multi-Sense driving control system, which helps the driver manage the car’s engine response, as well as upgraded ambience and sound settings for maximized driving comfort. On the back of the successful sales of the SM6, Renault Samsung is “eyeing at least a 30 percent increase in its total sales in 2016 compared to the previous year,” according to company CEO Francois Provost. The automaker has begun manufacturing the SM6 at its production plant in Busan. The vehicle’s official price will be announced in February, while local sales are scheduled to kick off in March.